Jerry Lee Martin was born on September 5, 1942 in Brown County, Texas near Lake Brownwood. He was the youngest of three boys and three girls born to George and Addie Martin. Jerry lived in the Brownwood area until he was four years old, at which time the family moved near Longview, in Northeast Texas. He graduated from East Mountain High School and then from Stephen F. Austin State University where he received a B. B. A. in Business Administration with a minor in Economics. He was Vice-President of Alpha Phi Omega National Service Fraternity that contributed many services to the University and the community. In 1998 Jerry lost his wife Carol after a courageous two year battle with cancer. Sometime later he met Betty Capps, a Masonic widow, at an Eastern Star function. There was only one seat left in the dining room and it was next to Betty. Jerry took the seat next to Betty and a close friendship developed that quickly grew into more than just friendship. They were married a year later. Jerry had one son, and Betty had two daughters. Jerry’s son Brent joined the Army shortly after graduation from high school. He was a Crew Chief on attack helicopters, and saw combat in Desert Shield. He is now employed by a contractor that provides maintenance for helicopters at Fort Rucker in Alabama. Betty’s daughter Theresa is a Marketing Representative for a healthcare provider, and her daughter Sandra is a homemaker. Betty and Jerry are members of the Schertz United Methodist Church where they actively serve as greeters, ushers, and anywhere else they are needed. After graduation from college in August of 1966, Jerry began his professional career in the J.C. Penney Regional Accounting office in Dallas, Texas that performed the accounting functions for hundreds of stores in six states. Three years later he was employed by Zale Corporation as an Internal Auditor, and one year later was promoted to Controller of the Sporting Goods Division. He later was promoted to Vice President of Administration in addition to serving as Controller. A major accomplishment during his employment at Zale Corporation was replacing conventional cash registers with data terminals that could collect information on items sold for automatic reorder and inventory control, transmit the day’s sales and bank deposit to speed the drafting of the funds, transmit payroll data and other information that was usually sent via US Postal Service. While this is common practice today, in the early 1970’s this was the first use of this kind of technology in Texas and the second in the United States. After leaving Zale Corporation, he was employed by Chromalloy American Corporation where he worked on a campaign that ended in the successful election for the passage of a sales tax increase to create and fund a public transportation authority in Austin, Texas. After the election he helped create the Finance and Accounting departments, and served as Assistant Director of Finance and Director of Accounting for the new Capital Metropolitan Transportation Authority. Later he was employed by the State of Texas Department of Human Resources where he was the Director of Information Technology Procurement and Contract Management Department that awarded and managed many multi-million dollar contracts that served not only his agency, but all of the Health and Human Service agencies. He retired in October 2002. Jerry petitioned Parsons Lodge No. 222 in Austin in 1996, where he was initiated, passed, and raised to the sublime degree of a Master Mason. He held many offices during the next few years, and served as Master in 2002-2003. He is an endowed member of Parsons Lodge and also is the recipient of the Golden Trowel. He is a charter and endowed member of Tranquility Lodge No. 2000, an endowed member of Blanco Lodge No. 216, an endowed member of Randolph Lodge No. 1268, a charter member of Point Isabel Lodge No. 33, and a member of the Texas Lodge of Research No. 1999. He served this Grand Lodge on the Masonic Family Convention Team in 2004 and 2005, the Masonic Education and Services Committee from 2006 through 2010, District Deputy Grand Master in 2008, State Coordinator 2009, Grand Orator 2009, and Chairman of the Special Assignments Committee 2009. 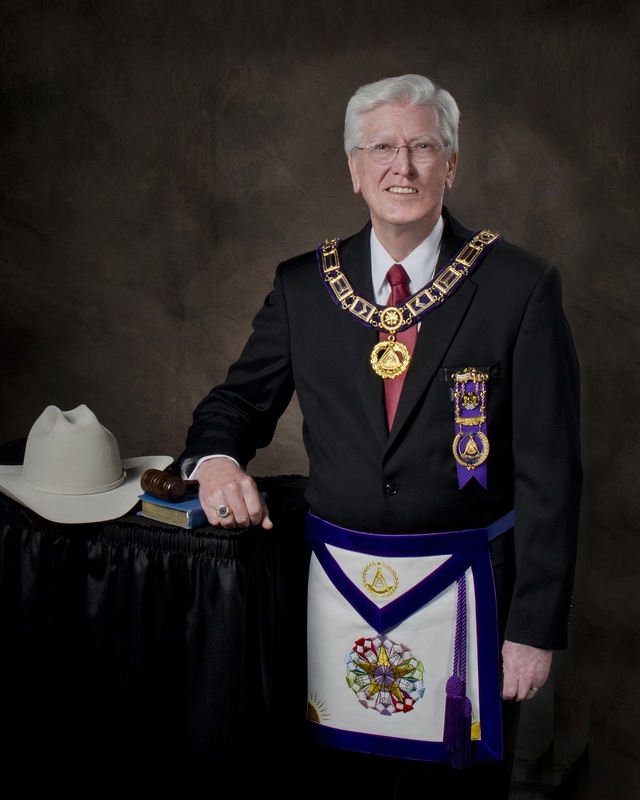 He is a member of the Sam Houston Hall of Fame, and is the Grand Representative to the Grand Lodge of Illinois. In an effort to give back to the fraternity he loves, he made himself available and was elected Grand Junior Warden at the Grand Annual Communication in December 2010, Grand Senior Warden in 2011, Deputy Grand Master in 2012, and Grand Master in 2013. Brother Martin is a member of the Austin Scottish Rite Valley and is a 33rd Degree IGH. He is a member of Austin Council No. 2 R.&S.M., Lone Star Chapter No. 6 R.A.M., Colorado Commandery No. 4, Texas York Rite College No. 14, St. Austin Conclave Red Cross of Constantine, Societas Rosicruciana in Civitatibus Foederatis, and the Commemorative Order of St. Thomas of Acon Fort Worth Crusader Chapel No. 62. He also is a Member in Perpetuity of Anson Jones Chapter No. 507 National Sojourners, Ben Hur Shrine, and Omala Grotto. He served as Worthy Grand Patron of the Grand Chapter of Texas, Order of the Eastern Star in 2005, and is an endowed member of Travis Chapter No. 472. He served the General Grand Chapter Order of the Eastern Star as Ambassador to Hawaii 2009-2012, and as a General Grand Chapter Committee member for Scottish Rite Charities 2012-2015. He received the Grand Cross of Color in 2005 from the International Order of the Rainbow for Girls, and the Honorary Legion of Honor from the International Supreme Council Order of the DeMolay in 2012. His love for our fraternity has led him to dedicating himself to the service of the Grand Lodge of Texas with aspirations of laying the ground work to aid in the preservation of our Grand Lodge for future generations. May God bless his leadership of the Masons of Texas.